Garages provide security for some of our most expensive items, including lawnmowers, tools and even cars. This makes it vital to have a strong, secure garage door to protect our belongings and metal doors offer that in abundance. Steel is easily the most used metal for garage doors in the UK and with hundreds of designs and finishes you’ll be able to find something that sets your home apart from the crowd. Garage doors can be manufactured to fit any size and there are a range of mechanisms you can choose from for how the door would open. However, be sure to use thicker metal in order to avoid stresses and creases distorting the steel panels. This type of garage door incorporates just one swift movement to open and rigidity at every angle ensures it remains strong. A locking system prevents the door from sliding back down once opened, making sure it’s safe too. The up and over system is one of the most popular in the UK because of ease of installation and cheaper price. It’s easy to operate as well and allows maximum space in the garage. 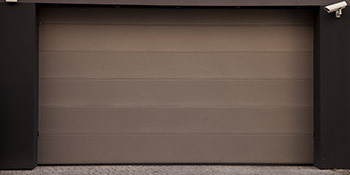 This type of garage door operates in a similar fashion to the up and over, but the sections allow you to partially or fully open the door. Sectional doors can be manufactured to 7,500mm in width and 3,000mm in height. These doors are growing in popularity throughout the UK and are simply installed by professional companies. Just like the up and over they allow maximum space in the garage. Roller shutter doors are a novel technique which allows the steel to unravel, whilst maintaining strength and providing a pattern for the front. This is often used for extremely large doors and is rarely seen in domestic use. No matter what garage door design you’re interested in, it’s important to ensure strength and durability. For up to four FREE quotes from vetted and reputable garage door installer, just complete our quick form. Project: new up and over garage door.standard size. Project: Quote on single door , electric roller garage door. Project: Replacement of Twin Hardwood doors to Bin Store & Bicycle Shed - 8 doors in total. Project: Incorrect auto validation Bin store doors credit agreed Replacement of Twin Hardwood doors to Bin Store & Bicycle Shed - 8 doors in total. The below information displays the energy performance of properties in Uk. Energy ratings range from A to G, with A being the most energy efficient and G being the least efficient. The Energy Performance Certificate (EPC) rating factors heavily when attempting to sell your home, as possible buyers will see just how much they're likely to be paying for their home heating bills. Property upgrades such as insulation help to substantially improve a home's EPC rating. The information underneath illustrates the various types of homes in Uk. The most commonplace properties across the United Kingdom are detached and semi-detached houses. Other kinds of households include terraced houses, flats, converted flats and bungalows. The pie chart underneath reveals the portion of households in Uk which are central heated and non-central heated. Central heating figures in the majority of UK homes, including those on the gas grid and houses heated by oil and electric. The information beneath displays the spread of households heated up by different fuels. Throughout the United Kingdom the most common undoubtedly are gas heated houses, followed by electricity and then oil. Biomass central heating boilers are also rising in popularity, heated by sustainable products including wood pellets or agricultural waste.|Houses in the UK are heated by a range of fuels, such as gas, electricity, oil, solid fuel and LPG boilers. Each fuel has a varying cost associated with it so you might find yourself with less costly energy bills by altering how your property is heated. Even solar thermal panels are being regarded as by many in order to reduce heating bills for the years to come.